My 2016 SHOT Show After Action Report is now at Part 5, which is also the final part in my AAR for the 2016 SHOT Show. 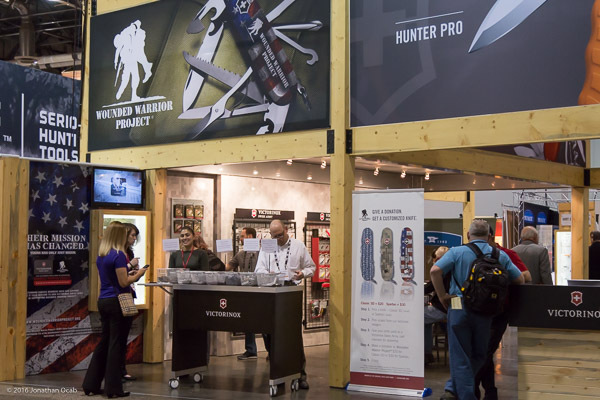 There were a lot of products at SHOT Show in all parts of the shooting sports industry, from hunting to tactical, rifles to reloading equipment, and a lot of activities from press conferences to product demonstrations, celebrity appearances and signings to after parties and get togethers. One company I wanted to bring up is FOURSEVENS. FOURSEVENS is a fairly young company specializing in high performance LED based flashlights, and have a positive word-of-mouth amongst the illumination tool enthusiasts on the Internet. I own one FOURSEVENS light which I caught wind of via the Instagram feed of Adam Craniotes (Instagram: @craniotes) who I follow for his wrist watch expertise and taste, who also happens to have a penchant for knives and flash lights. 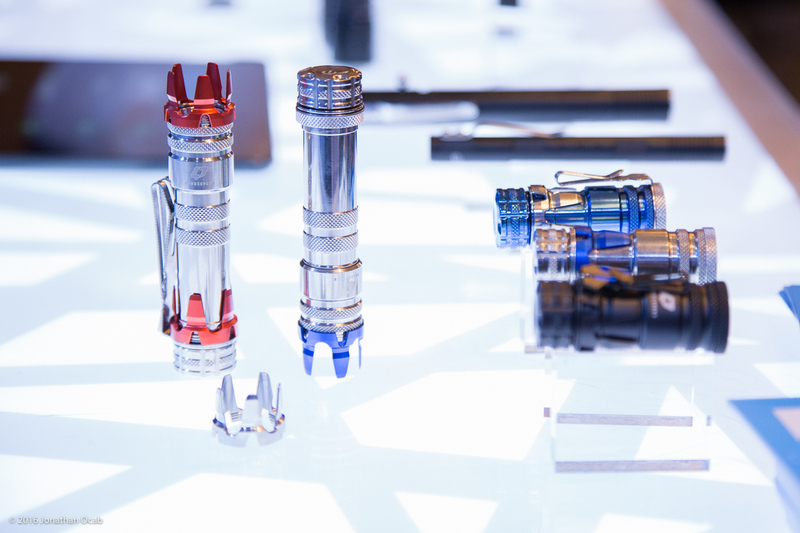 The light in question is the FOURSEVENS Knight, which is the less expensive, Type III hard anodized aluminum version of the Paladin, which Craniotes posted and is constructed out of PVD polished titanium. Author’s personal FOURSEVENS Knight LED flashlight purchased in Nov 2015. 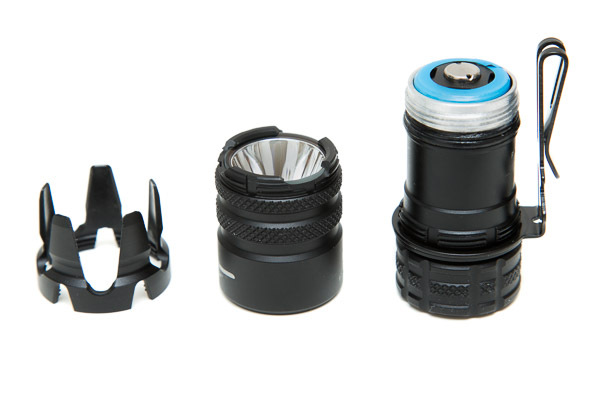 The FOURSEVENS Knight pushes out 25 lumens on low and 450 lumens on high with a single CR123A battery for 30 hours and 2 hours runtime, respectively. What caught my eye was the wicked looking strike bezel, and the styling of the light itself. 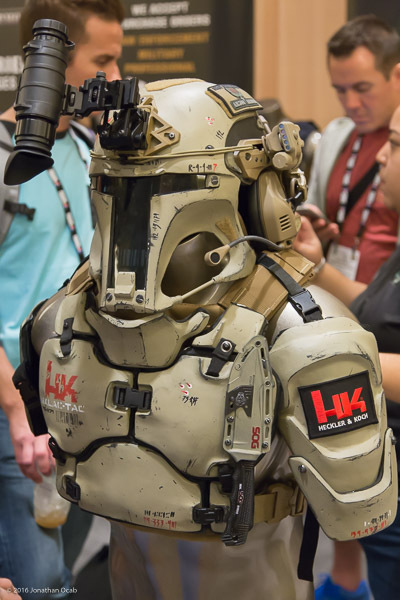 When I came across the FOURSEVENS booth, I took notice of the larger two-CR123A version of the Knight / Paladin. I didn’t get a codename for this light (or the MSRP), but you should anticipate the two battery version out later this year. I spoke with representatives at the Brownells booth because I wanted to discuss the state of Brownells Edge. I subscribed to Brownells Edge last February and I ordered enough items to break even on the free shipping since I have had my subscription, but other than than one exclusive coupon code, I really didn’t see any other extra benefits from Edge. Since I already shop at Brownells often for parts, accessories, and tools, I don’t really lose that $50 a year. But at this point, there really isn’t much incentive to join Brownells Edge, especially for the consumer that is always looking for the cheapest deal. I equate Brownells Edge loosely to Amazon Prime. But the advantage of Amazon Prime is the fact that you get free 2-day shipping on Prime eligible items, and often, those items arrive same or next day for no added fee. Not to mention prices on Amazon are better than local brick and mortar stores. Obviously, it’s very difficult for Brownells Edge to be as good as Amazon Prime, considering they are two completely different market segments, not to mention, Amazon has a far bigger distribution infrastructure which cannot be matched by a company solely in shooting related products. But how can Brownells make Edge more enticing to general customers? I intimated to the Brownells representative that more coupon codes would be one way to incentivize people, but obviously, a company can only go so far without losing money. One idea that the representative mentioned they were looking into is exclusive and/or early access to limited / high demand items. Perhaps when a new product is added to the catalog, Edge members will get first crack and ordering before non-Edge members. I think this actually one tangible and worthwhile benefit that doesn’t cost Brownells (although, it might irritate non-Edge customers). 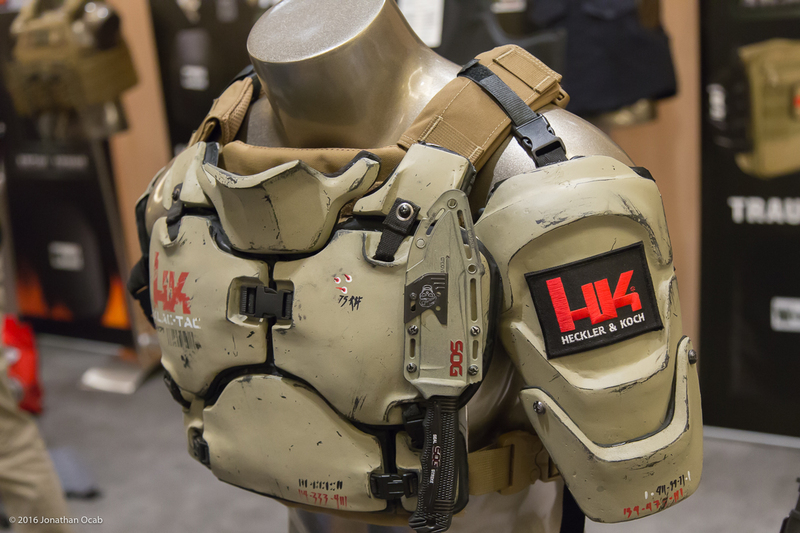 From what I was told, a survey will be going out to existing Brownells Edge members to ask for thoughts on opinions on how to make the program better. So if you have any ideas, send them to Brownells. Victorinox partnered up with the Wounded Warrior Project to create some WWP patterned knives, and donate 5% of all sales to the WWP. 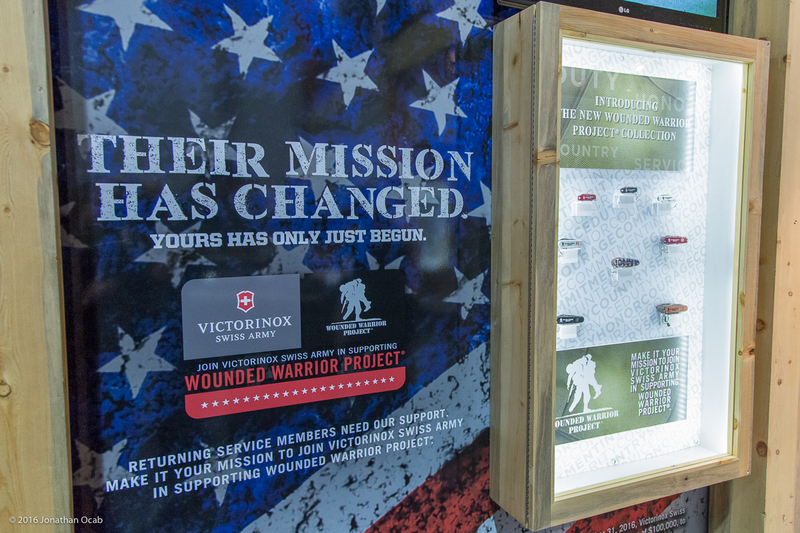 But, they had a “build a knife” station at the 2016 SHOT Show where 100% of the donation for the knife is given to the WWP. I have been donating to the Wounded Warrior Project off and on for about 10 years now. 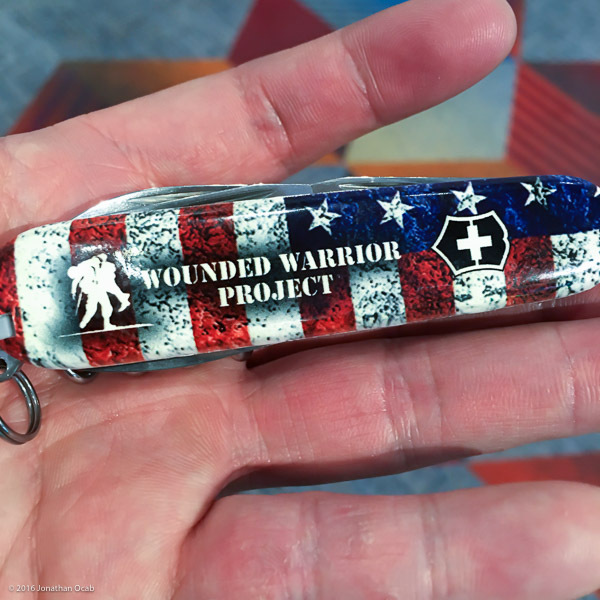 I know there is always a lot of skepticism regarding charities, but they seem to be getting the word out on the plight of wounded (physically and mentally) veterans which is why I still give my support. Anyway, I picked up a Victorinox Swiss Army knife to give to my mom. 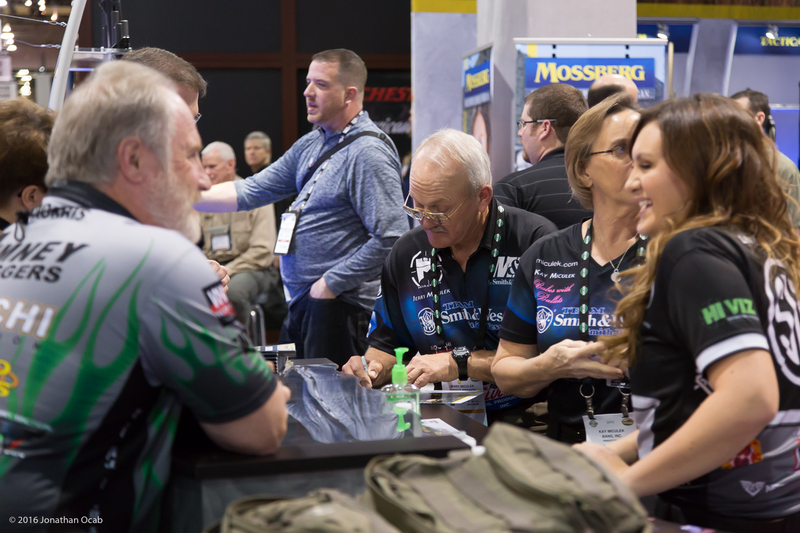 As far as the 2016 SHOT Show in general, I felt that it was another positive experience on par with previous SHOT Shows. The National Shooting Sports Foundation did a better job with catering the Press Room in the mornings. It seemed like there was a lot more food than previous years, which ran out quick. I ended up staying at the Palazzo Hotel this year, which is the first time I stayed at the Palazzo (or Venetian), much less for SHOT Show. 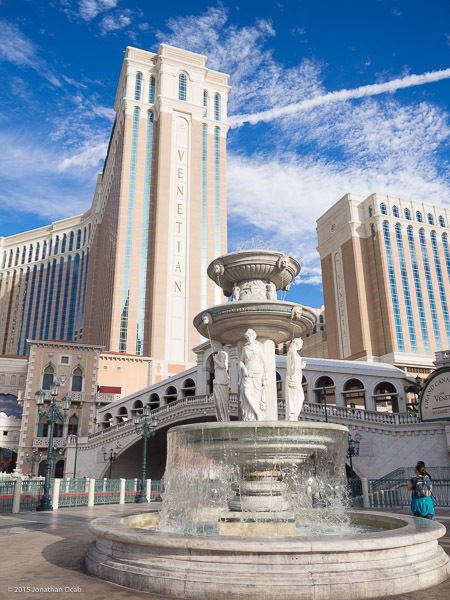 In previous years, I would actually stay at other hotels because the rates were far cheaper elsewhere, even compared to the SHOT Show group rate pricing for the Venetian and Palazzo. For a long time I stayed at the Vdara, and if you’ve never stayed there, you should give it a try. It is a non-gaming hotel on The Strip, but the rooms are huge (and include an actual kitchen with full-size refrigerator, dining table, microwave, stove, etc), and rates run comparable to center strip hotels, if not cheaper on weekdays. I eventually switched to staying at the MGM Grand Hotel during SHOT Show the past couple years because of the convenience of the Las Vegas tram. But this year, hotel rates were double or triple normal rates I’ve seen in previous years. Supposedly there was a huge demand of rooms because of multiple conventions during SHOT Show week (translation: gouging). 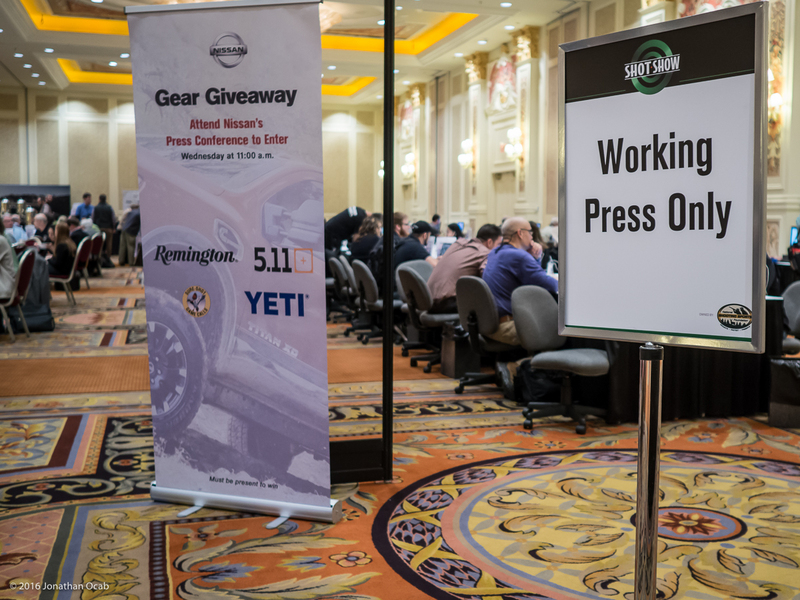 Anyway, the SHOT Show group rate for the Palazzo / Venetian was the best rate for a decent suite, so I ended up at the Palazzo for the 2016 SHOT Show. That being said, I think I will stay at the Palazzo again next year. The fact that I can leave the show floor at the Sands Expo and go to my hotel room in ~15 minutes is too convenient. For example, on day one of the show, I went to grab lunch at the Venetian food court and it was packed. I ended up getting a Subway sandwich to-go and taking it back to my room and eat lunch while I caught up on email. My one complaint about the SHOT Show group rates through the onPeak service is that the booking site terms and agreement indicate that if you cancel your reservation, you lose your deposit (first night room rate plus tax). I really wish onPeak changed this policy. Even if they don’t want to allow cancellation up to 48 hours before (like normal hotel policy), at least give cancellation with full refund up to two or three weeks prior. That concludes my 2016 SHOT Show After Action Report. 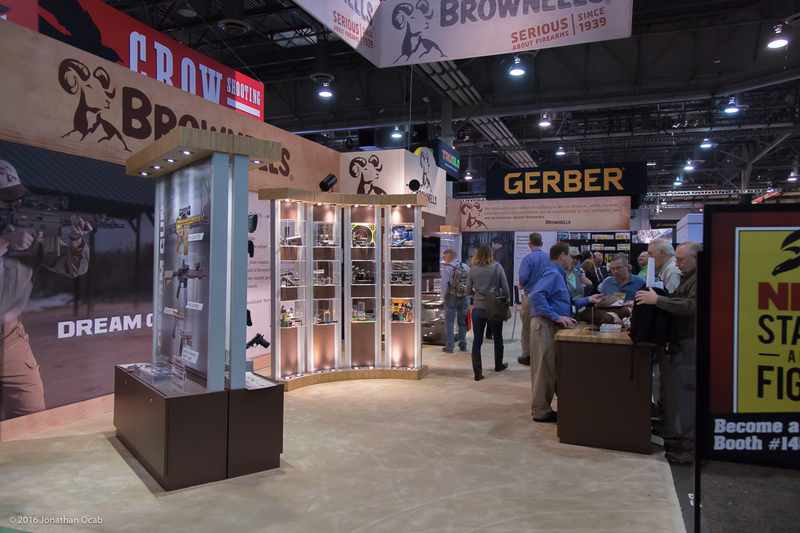 My coverage of SHOT Show is a mere grain of sand in the grand scheme of the event, so you should also seek out other SHOT Show reports to get more information about the other products that interest you. 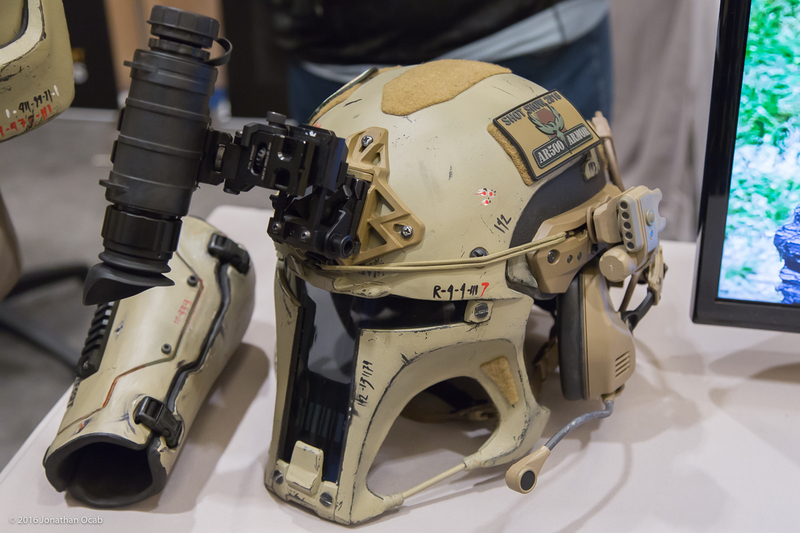 I will leave you with some photos of some Boba Fett / Mandalorian inspired armor made by AR500 Armor and designer Ryan B. Flowers. 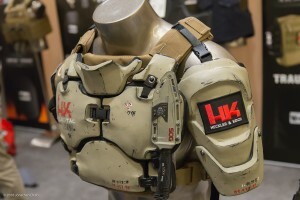 Note that the version below is made out of actual ballistic plates. Shout out to Benchmade Knives for offering sharpening and servicing at the SHOT Show, just like every year. 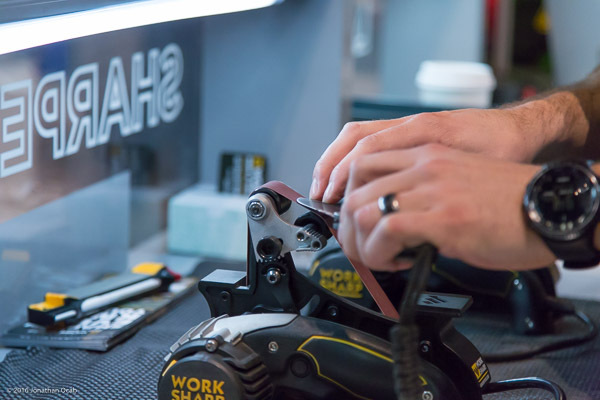 It seems like the Work Sharp Knife and Tool Sharpener is becoming quite popular, and Benchmade has been using these at SHOT Show the past few years. Considering I can’t sharpen a knife with a regular sharpening stone for the life of me, I should probably get one.